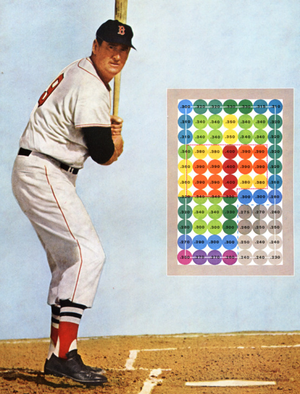 Ted Williams (1918-2002) was arguably the greatest pure hitter who ever played the game of baseball. He’s the last person to cross the magic .400 barrier, which is an exceptional feat. It means he succeeded in getting a hit 40% of the time. It also means he failed 60% of the time. How did he do it? And more importantly what can we learn from him that will help us make better decisions? I’m not a huge baseball fan. But Ted Williams wrote a book, calledThe Science of Hitting. The book contained a very interesting picture, of himself at bat with the strike zone broke into 77 individual squares. Williams understood that an important aspect to improving the odds of making good choices is the ability to distinguish between decisions within our circle of competence and those on the outside. If he waited for a pitch that was really in his sweet spot, he would get a hit 40% of the time. But if he was impatient and swung at something on the lower corners he would only get a hit 23-25% of the time. Williams grasped that the way we make decisions — our decision process — matters. The first step in baseball to getting a hit is to wait for a good pitch. A good hitter can hit a pitch that is over the plate three times better than a great hitter with a questionable ball in a tough spot. Only this isn’t Williams idea. It comes from baseball legend Rogers Hornsby, who told told Williams that the single most important thing for a hitter was to get a good ball to hit. This is how Williams came to carve the strike zone into 77 spaces, each the size of a baseball. Waiting for a good pitch required knowing which pitches offered him the highest odds of success and the patience and discipline necessary to wait for them. These factors would make the difference between a trip to the minors and the hall of fame. Now we’re not all baseball players but we all have a zone where the odds are tilted in our favour, called our circle of competence. This is an area in which we are capable of understanding with a high degree of probability the relevant variables and likely outcome. Making decisions within our circle improves the odds we’ll do well. This is our sweet spot and it’s different for all of us. The problem is everyone wants to have a large circle. We think bigger is better. But the size of the circle is not really what’s most important. Knowing the boundaries of our circle of competence is more important than its size. As Richard Feynman pointed out, familiarity with something is different than competence. If we have a strength, it is in recognizing when we are well within our cycle of competence and when we are approaching the perimeter. Predicting the long term economics of companies that operate in fast-changing industries is simply far beyond our perimeter. If others claim predictive skills in those industries—and seem to have claims validated by the behaviour of the stock market we neither envy not emulate them. Instead, we just stick with what we understand. If we stray, we will have done so inadvertently, not because we got restless and substituted hope for rationality. Unlike Williams, Buffett can’t be called out on strikes if he resists pitches that are barely in the strike zone. He can, quite literally, wait for the perfect pitch—looking at thousands of different investments before finding one that is just right. That explains why he bats pretty close to 1.0 while Williams had to settle for less. In some decisions, such as investing, we can choose to do the same thing. We can sit around, read, and wait for the right opportunity. Most decisions, however, are not of that nature. We simply don’t have the option to wait for the perfect pitch. We have to make decisions in an uncertain world with imperfect information. Knowing the boundary of our aptitude, where we bat above average and where we don’t, can help guide those decisions and how we make them. Williams batting average dropped off when he swung outside his core, and so to will ours. If we have to decide something and we know we’re not in our sweet spot, we can take steps to improve the odds of making the a better decision. Or, at the very least, acknowledge that the decision we’re making is risky; We know we’re the patsy. Whatever decision you’re making, know where it falls in your strike zone. To the extent possible you should attempt to deal with things that you are capable of understanding.